"Your duty to investigate this matter is clear," Bondi wrote to FDLE. But state officials repeated that they've found no evidence of fraud. Florida Attorney General Pam Bondi strongly urged state police Sunday to investigate Republican claims of voter fraud in Broward and Palm Beach counties — a day after the Florida Department of Law Enforcement said it found no evidence of it. In a sharply-worded letter to Florida Department of Law Enforcement Commissioner Rick Swearingen, Bondi wrote that she was "deeply troubled" that he hadn't opened an investigation. "Your duty to investigate this matter is clear," Bondi wrote, in a letter to FDLE Commissioner Rick Swearingen. "I am directing you to take the necessary steps to promote public safety and to assure that our state will guarantee integrity in our election process." While Bondi, as the attorney general, has some standing in the issue, FDLE is an independent law enforcement agency and is not required to follow her directive. Swearingen couldn't be reached Sunday night. Bondi, a Republican, is a close ally of Gov. 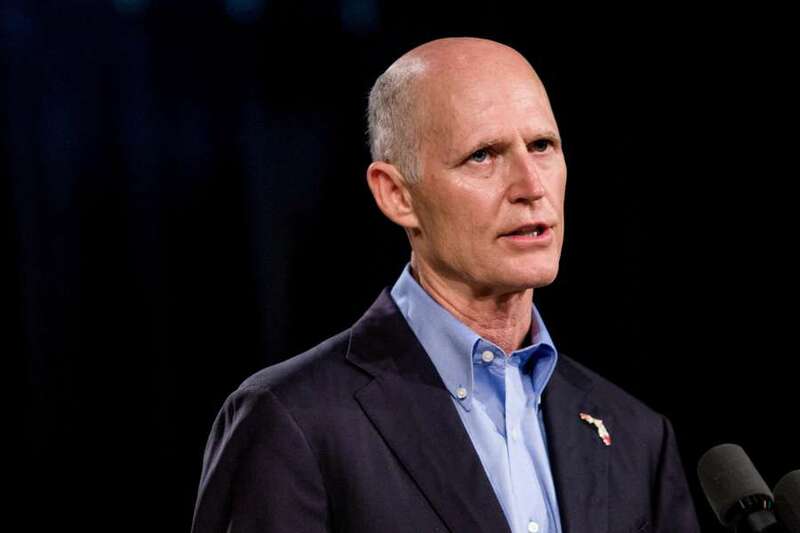 Rick Scott, who made claims of "rampant fraud" during a Thursday night news conference, where he alleged the supervisors in Broward and Palm Beach were helping his opponent, Democratic U.S. Sen. Bill Nelson. FDLE has said that it had not opened an investigation because workers from the Secretary of State, who have been observing the election in Broward County, have not reported any fraud. The Secretary of State said again Sunday that there was no evidence of fraud. Scott, whose U.S. Senate race against Sen. Bill Nelson hangs on the results, had asked FDLE to investigate "rampant fraud" there during a Thursday news conference. He provided no evidence of fraud and was making that request as a candidate, not as governor. He's since gone on Fox News several times repeating the claims of fraud but providing no evidence of it. Bondi, a Republican, is a close ally of Scott. And she's said to be in contention as President Donald Trump's pick as the next U.S. Attorney General. Trump has repeated Scott's claims of voter fraud. Bondi on Sunday implied that the verbal request from Scott, rather than a written one, was enough for FDLE to open an investigation. "Regardless of who the complainant is, I expect any responsible law enforcement agency, and certainly the Florida Department of Law Enforcement, to evaluate the credibility of the source who made the verbal request, gather facts, and conduct an inquiry rather than simply citing the lack of a piece of paper," she wrote to Swearingen. A request for comment from FDLE Sunday was not immediately returned. Bondi can ask FDLE to look into something, but the agency doesn't have to obey her, according to former Attorney General Bob Butterworth, the last Democrat to hold the seat. "If that's what she wants to do, she has the authority to do it," Butterworth said. Still, the move could put political pressure on Swearingen, who owes his job to Scott, Bondi and the two other members of the Florida Cabinet. They appointed him in 2015, after Scott controversially forced out former FDLE Commissioner Gerald Bailey. Bondi also wrote to Secretary of State Ken Detzner, encouraging him to look for and report any fraud. She also instructed him to report any suspicion of fraud to the Office of Statewide Prosecution, which is under her jurisdiction. Detzner's office said again Sunday night that observers have found no evidence of fraud. "Department staff continues to observe the administration of the election in Broward County," spokeswoman Sarah Revell said. "Our staff has not seen any evidence of criminal activity in Broward County at this time. "Our top priority is a fair and accurate election. We will continue to work with the Florida Department of Law Enforcement and the appropriate jurisdictions to report any suspected elections fraud or criminal activity." Palm Beach County State Attorney Dave Aronberg, a Democrat who used to work for Bondi in the attorney general's office, also said that he has seen no evidence of fraud. Bondi's request was on top of another push by Scott on Sunday to get state police to intervene in the election. His lawyers filed emergency motions requesting that FDLE agents and sheriff's deputies in Broward and Palm Beach counties "be required to impound and secure all voting machines, tallying devices and ballots" when they weren't in use, according to his campaign. Eugene Pettis, attorney for Broward's Supervisor of Elections office, said Broward and Scott's campaign couldn't come to an agreement over custody of the voting machines and will have a hearing in front of a judge sometime Monday. "They have control here," Pettis said, referring to the law enforcement officers watching the process and the elections monitors watching the process for the last few weeks. Close contests for U.S. senator, Florida governor, commissioner of agriculture and three legislative races, including a Tampa Senate race, had triggered machine recounts. Most of them started Sunday. All of them must be finished by Thursday afternoon. While some of Florida's 67 counties expect to meet the deadline comfortably, others are finding trouble. In much-maligned Broward — the populous, Democratic bastion that lagged in its initial tally, then mixed up 20 invalid ballots with some 200 legitimate ones — stumbled yet again. Officials, led by Supervisor of Elections Brenda Snipes, need to recount more than 700,000 ballots and meant to start at 7 a.m. But a series of technical glitches delayed the recount more than four hours, until 11:23 a.m. The standard logic and accuracy tests supervisors run before recounts failed repeatedly as candidates' lawyers watched. But no actual counting would begin for hours and possibly days. Until sometime Monday evening, the counting machines will do nothing but pluck out the first pages of ballots, which feature all the races to be recounted. Then, they'll have to start adding them up. It's a substantial challenge, one that's intimidating for officials in the other county Scott has sued, Palm Beach. There, Supervisor of Elections Susan Bucher, an outspoken Democrat, started the recount process at 5 p.m. Saturday, the Palm Beach Post reported. She said that even bringing in extra county workers couldn't solve the problem, deeming Thursday's deadline "impossible" to meet. "I will tell you that the secretary and the legislature and the governor have been extremely aware that with the election equipment we have, the potential of conducting all of these is impossible," Bucher told the Post. "We have asked the secretary if there was any consideration to extend the deadline, and he said 'no.'" Tampa Bay elections supervisors aren't worried. Though Hillsborough officials dealt with a quick paper jam just two minutes into the recount, Supervisor of Elections Craig Latimer said he had no doubt his office would recount their more than 520,000 ballots by Thursday's 3 p.m. deadline. Nor did he see the likelihood that the results would shift much. "I do not expect to see significant change," said Latimer, noting that in a Hillsborough School Board recount in 2016 the winner started with a lead of 0.26 percentage points and after the recount ended with a lead of 0.26 percentage points. Across the bay, Pinellas officials were similarly confident they'd finish on time. The county was running between 15,000 and 20,000 votes an hour Sunday. "We are on target right now," spokesman Dustin Chase said Sunday afternoon. "There is no mathematical reason for us to go to a 24-hour day." After Thursday, when counties must finish their machine recounts, any race within a 0.25 percent vote margin will trigger another recount. In this second, manual, recount, whenever machines read a ballot as listing too many candidates in a race (both Ron DeSantis and Andrew Gillum, for example) or no candidates at all, the county's canvassing board will look at the paper ballot and try to determine voter intent. Lawyers for candidates observe the whole process. The deadline for the manual recount is Sunday at noon. Meanwhile, states must also count overseas ballots, which are due Friday. J.C. Planas, a Republican lawyer from Miami monitoring one of the recounted races — the Tampa state Senate race between Dana Young and Janet Cruz — has worked on multiple Florida recounts and agreed the likelihood of the results changing in most of the statewide races is slim. "The whole process will add between three and five new voters per 5,000 to 10,000 ballots," said Planas, a former state lawmaker. "And then they almost always break down in the same proportion (as the preliminary results)." Times/Herald reporters Elizabeth Koh, Samantha J. Gross, Steve Bousquet, Langston Taylor, Times Political Editor Adam C. Smith, Times National Political Correspondent Steve Contorno and Miami Herald staff writers Alex Harris, Jay Weaver, David Smiley and Glenn Garvin contributed reporting.